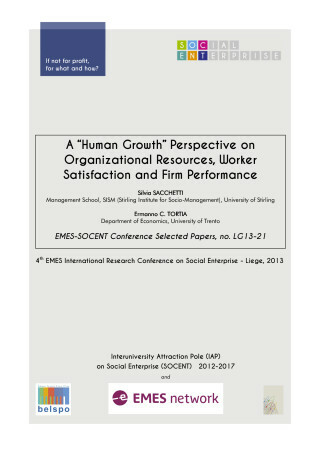 The paper deals with the mediating role of immaterial satisfaction between substantive organizational substantive features, defined as resources by on-the-job autonomy, involvement, teamwork and workload pressure, and organizational performance, defined in terms of improvements in product quality and innovation. We address this relationship in the Italian social service sector using a survey dataset that includes 4134 workers and 320 not-for-profit social cooperatives. We apply a structural equation model including both observed and latent variables. Direct, indirect and total effects in the structural model show that: (i) worker autonomy in introducing innovation positively influences performance; (ii) involvement bears positively on performance when its effect is mediated by immaterial satisfaction; (iii) the negative impact of task-autonomy on performance is almost counterbalanced by its positive impact on worker satisfaction. To control for common method bias we resort to post-hoc testing and introduce three distal sources of subjective data from directors, managers and paid workers.